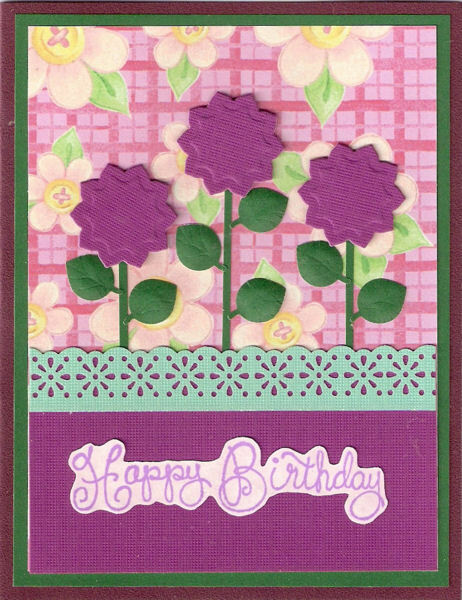 A triplet of cheery purple flowers bring wishes for a happy birthday. Cut a 2" x 3.75" rectangle from purple card stock. Cut and emboss three flowers using the 1 inch Nestabilities Blossoms 2 die. Cut a 5/8" wide strip from green paper and punch with Daisy scallop border punch. Stamp Happy Birthday in purple ink on pink card stock. Cut around stamped words. Affix flowers with foam squares.